# Put one yolk of the eggs aside. Mix the remaining eggs with milk and vegetable oil in a deep bowl. # Lay one of the yufkas over the bench. Pour 4-5 tbsp milky mixture all over it. Then, lay it to whole surface by a brush. # Fold the circular edges of the yufka over the center to shape it as square. Then, spread milky mixture all over again. 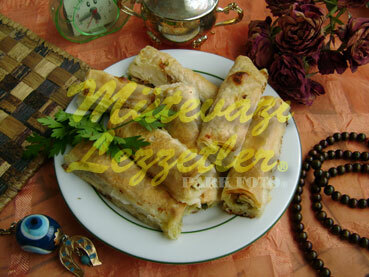 # Place the mixture of cheese and finely sliced parsley onto one of the edges of the square shaped yufka. Place the some of the same mixture onto the opposite side of the square also. # Make two rolls which stay side by side in the center of the yufka. # Place the borek into the greased baking tray at this position. Prepare the remaining 5 yufkas by this way also. Place them into the tray also. # Add the yolk, which you put aside before, into the milky mixture and whisk it. Then, pour this mixture all over the boreks standing in the tray. # Slice the boreks in the tray. Each of the slices should have 3 inches thickness. # Bake them in the oven, which is preheated to 356 F, until they turn into red. Note: This borek may be prepared with ayran instead of milk.